After the frustrations of not feeling good enough to get through the crux of my Steall project, I took a small break from it which consisted of some diligent training, family time and writing some more of my book. I could probably have taken more time doing those things, but the prospect of some better conditions and a trip away getting imminent demanded going back up for another couple of sessions. On one session, when it was still feeling a bit hot and windless, I couldn’t even do one of the moves in isolation. I lowered off and felt pretty dejected. I was practically ready to leave it until next season. When it was my turn to climb again, I went for another go as a formality. A small breeze started up at the same time as I did. The holds instantly felt stickier and next thing I knew I landed the last of the crux moves. I soldiered on in extremis for a few more moves before falling, completely pumped, from the last really difficult move at the last bolt. That was a real eye opener. For one, I learned that conditions matter even more than I would ever have given credit. To go from unable to do single moves, to almost succeeding on linking the whole thing in the same session, because of a few gusts of wind is a massive effect. Second, I learned for the first time that the route is definitely possible for me. I think If I could replicate that effort a few more times, I’d struggle through to the belay one time. After that session, I must admit that a wave of utter determination to try my best to finish it came over me. However, maybe that was my best effort, and I’ll not be able to match it before the autumn monsoon? I’ll find out. It doesn’t matter really. I’m just pleased to know I’m not wasting my time trying the project. Next session, I held the last crux move again but sadly my foot slipped straight afterwards. A good sign of consistency. I battled on for a couple more sessions in crap conditions, hot, humid, still and midgy. I still got really close even in those conditions. I had a sick feeling in my stomach that the temperature would drop and and wind would arrive just after I ran out of time before leaving, and that’s exactly what happened. So I am a coiled spring, and will somehow have to try and keep my powder dry for a while. I must admit I'm struggling with that more than I ever have right now. I suppose that's inevitable since it's biggest project I've ever tried. The likelihood is that I’ll be back again next spring for another scrap, unless I’m lucky and late September is dry enough to keep the seeps at bay. Of course I’m well pleased to have got as high on it as I have. 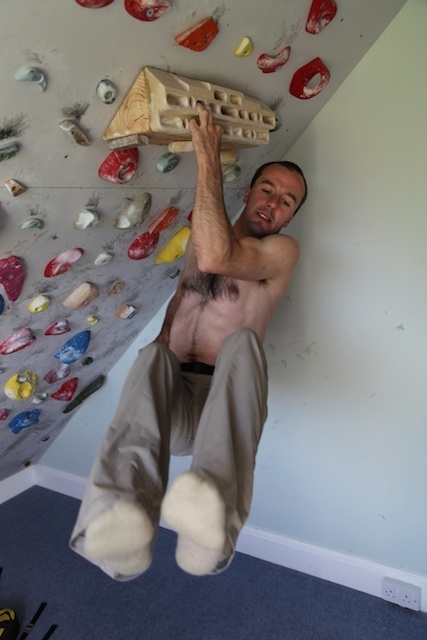 I’ve certainly put in a lot of work, both at the crag and in training and really feel stronger for it. On my last attempt of one session, I climbed the lower section in full knowledge I was too tired to have a serious shot at the upper crux. As I climbed through the first crux (Ring of Steall 8c+) I took my hand off to reach for the hold, felt tired and hesitantly went to grab the quickdraw and end the attempt and then changed my mind and carried on reaching, statically. When I did the first ascent of Ring of Steall in 2007 getting through that move was the hardest link I’d ever done and now I can do it nearly every attempt in decent conditions. At that time I couldn’t have imagined doing the move statically. I’ve really realised that I have so much room to step up my training and effort level yet. 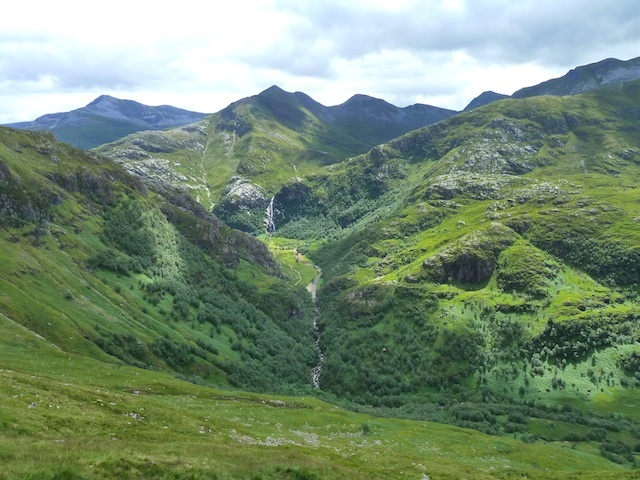 A while ago on Twitter I mentioned that the Steall Gorge path in Glen Nevis had been entered into a vote based competition to win £25,000 of funding for restoration and upgrading. I asked you guys to make a couple of mouse clicks and vote. Thanks for that - it won and was awarded the money! However, making a proper upgrade to a path like that (cutting through a very steep rocky gorge) does take a fair bit of money to undertake the full scale of work the John Muir Trust (the landowner) wants to make. So they are trying to raise a further £60,000 to do the job properly and fully upgrade the path. I’m sure many of you guys have been through the Steall Gorge and know that it deserves a well constructed path (it gets a lot of use!) and that folk do have bad accidents there from time to time. The good news is £42K of the shortfall has already been raised. If you want to help them secure the remaining £18K, donate here. It’s an easy process. I completed it in about two minutes. If everyone of you who regularly reads my blog over a a few days donated £1, it would be in the bag. So, I’m close to my project, but close is nowhere. If I had a run of cold windy days, I could see it happening. But It’s August, the wind is set in coming from the humid south, and so it’s not happening. The Steall midges are very well fed on my blood and I’m only getting the same highpoint and more and more frustrated and restless. What to do? Sure I could just keep at it. Motivation is not a problem. Call me a mad man, but I don’t really care how many midge bites I get or how long it takes. My will is much stronger than a few thousand tiny midges. Another day of overheated redpoints in long sleeve top and midge hood might wont send me over the edge, but there are other issues. I don’t want to get too used to having bad sessions and forget to try really hard when good conditions come along. Also, climbing on the same route too much isn’t so good for the body. I’m waking up stiff and sore when I ought to be fine. So the coaches prescription is to go and do something else for a bit. Keeping going in the current crap weather might be too risky for injury and the negative mental aspects might overtake physical strength gains. Tomorrow I’ll see where the mood takes me and try something new. Since this site is one of the main places on the web to get information about training for climbing and our shop sells all the best books on the matter, it was about time we started selling some of the best training equipment too. So priority number one was to get hold of the best fingerboards on the market right now; the Beastmakers. Designed by Font 8b+ boulderers and made out of rather lovely skin friendly wood, their design is clearly a labour of love and that is why they have become so popular in the UK. Oh, and they make your fingers strong. Well, owning one isn’t enough on it’s own. It’s the numbers of hangs clocked up that get makes the jumps in grades we all want. 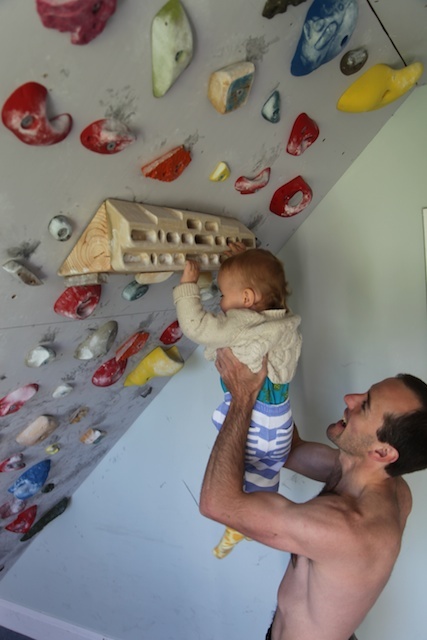 But having a well designed and skin friendly hangboard is a good first step. I started fingerboarding in summer 2005 just after I first tried Rhapsody. At the time I was climbing F8b and the odd 8b+ and about 8A on boulders. After a solid summer doing my deadhangs most days I got back on the sport climbs in the autumn and was blown away to discover I could now climb 8c. The following year I did Rhapsody and the year after that my first 9a. That raw finger strength was obviously the ingredient that propelled me forward to grades I never thought I’d get to. There are of course many young strong lads I’ve seen and coached in walls up and down the UK who would wipe the floor with me on a hangboard yet can’t climb nearly as hard outside, since power is nothing without technique. And technique is just as hard won as finger strength. So every climber needs to have a balance between learning technique and learning to pull hard. However, every climber who spends any time training or aspiring to harder grades should have and use a fingerboard. And if they are going to own any one, a Beastmaker is a pretty good choice. We are stocking both the 1000 and 2000 models. The 1000 is designed with those new to training in mind (Font 5-7C) and the 2000 is a better choice for those already used to bouldering walls and basic strength equipment (7C-8C). They cost £75 with our normal £1.50 shipping. Shipping to Europe and the rest of the world are at normal Royal Mail rates. Get hanging and get strong. The 1000 is here and the 2000 is here. The Milo of Croton school of training with Freida MacLeod. I wonder how long I can still manage this? Conditions have been dry enough for another 2 sessions on my Steall project albeit in the heat and more than a few midges. Objectively, they were pretty good and still showing progress. Diminishing progress, but still progress and as good as I could expect. On the first session overlapping halves more consistently than before, and then overlapping halves for my warm-up once. I ought to be happy with the progress but it’s hard not to balance this against restlessness that such good links and feeling strong on the moves doesn’t translate to getting any higher from the ground yet. All of this renews my respect for the route. On some attempts I did notice a ‘head problem’ creeping in that I was feeling the inevitability of how I was likely to get on in the attempt. That usually means it’s time to take another tack. I’m 95% there. I can see I don’t have much to do, but not much more to give either. My endurance training has worked well and I’m not really feeling pumped when I fall, just ‘powered out’. It seems maybe my strength to weight ratio is just not quite there. So I’m stepping up the attack on both sides of the ratio with a beefed up fingerboarding routine, using a 10kg weight belt to up the intensity and decrease volume on my circuits and a very organised diet which isn’t something I do often. I tend to ‘train heavy’ most of the time since my somatotype is heavy, and only get slim when It’s totally clear it will be worth it. The main reason is that it’s logistically difficult to balance a routine of hard climbing and training without running into various problems of underfuelled training, injuries, illness etc. But in the short term it works really well. Fingers crossed for the route be dry enough to get a try or two next week. I definitely feel that working on it and feeling strong in bad conditions might still set me up to be in a really great position if we get some cold and windy weather sometime.